Hearing noises in her bathroom, she called 911. Police found this inside. The 911 call comes in at 1:48 p.m. A woman tells the dispatcher someone is in her bathroom. The bathroom door is locked, but she can see shadows moving beneath the door. Several deputies of the Washington County (Ore.) Sheriff's Office arrive at the scene within a minute and surround the house. They request that a police canine be brought to assist them. Inside the house, deputies approach the bathroom. They can hear sounds coming from behind the door. Deputy Rogers (we assume it's Deputy Brian Rogers) would later describe the sound as "rustling." The deputies make several announcements and command the suspect to come out of the room. The suspect ignores them. The rustling becomes more frequent. Left with no other choice, deputies draw their guns and break down the door. 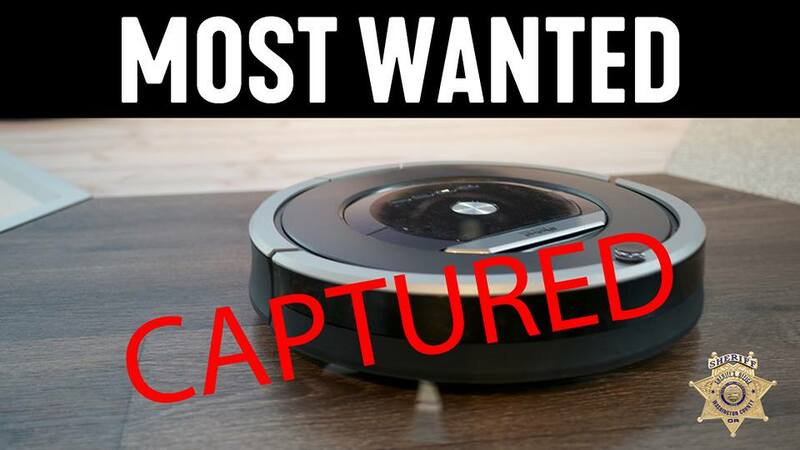 Inside they encounter the culprit — a Roomba Robotic Vacuum Cleaner enthusiastically hoovering around in circles. In his incident report, Deputy Rogers commented that the Roomba's vacuuming job was "very thorough." The sheriff's office recounted the incident in a Facebook post Tuesday, but did not mention what day it occurred. It also did not explain how the Roomba locked the door (maybe it pushed the door closed while the lock was engaged?). Interesting.. It's my idea for scare off home invasion.